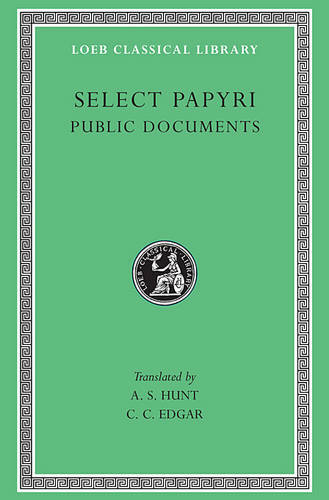 This volume presents papyri relating to public business of various kinds in Egypt from the middle of the 3rd century BCE to 710 CE, thus including affairs in that country first when it was ruled by the Greek Ptolemaic kings, secondly when it was a Roman province. The earliest examples date from the reign of King Ptolemy II Philadelphus and the latest from the government by the Arabs after their conquest of Egypt in 639-641 CE. The papyri chosen were all sent by persons in office (from king, Roman emperor, or governor downwards) or addressed to them or sent for their information: Codes and Regulations, 6 examples. Edicts and Orders, 26. Public Announcements, 6. Reports of Meetings, 3. Official Acts and Inquiries, 5. Judicial Business, 18. Petitions and Applications, 44. Declarations to Officials, 30. Appointments and Nominations, 7. Tenders and Contracts, 19. Receipts, 26. Orders for Payment, 6. Accounts and Registers or Lists, 12. Letters, 16. Notes on the systems of dating and of money in Egypt as well as a glossary of technical terms are provided. The three-volume Loeb Classical Library edition of Select Papyri also includes a volume of poetry and one of private documents.